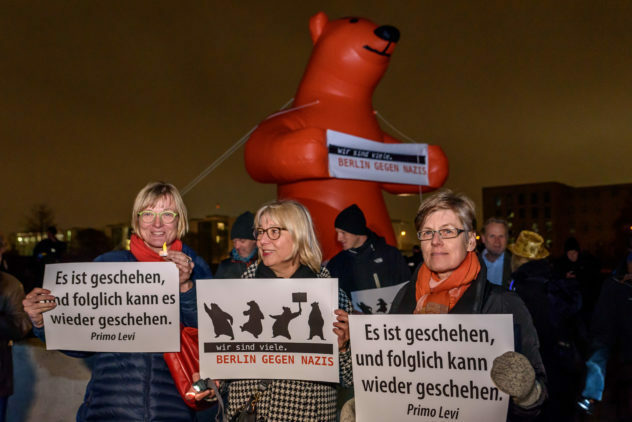 The right-wing extremist provocation of an attempted march through Berlin’s center on occasion of the 80th anniversary of the pogrom night of 1938 lead to a broad mobilization of several committees and initiatives to counter-protests. Furthermore, an open letter initiated by Aktion Sühnezeichen Friedensdienste, addressed to the Berlin Senate, demanded to ban the march. 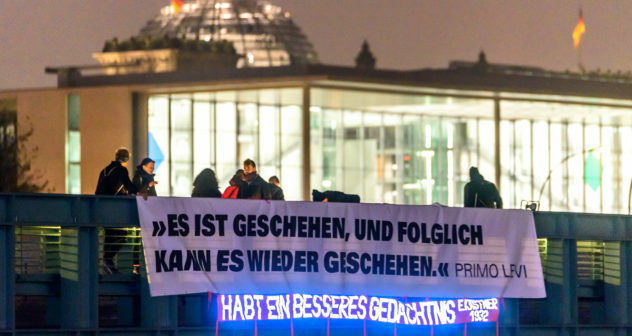 Two days prior to the march, the demonstration was banned by the administrative authority, and Berlin’s Senator of the Interior positioned himself decidedly against the right-wing extremist provocation on November 9 in a statement. Through the judicial clarification following, the ban of the march was annulled hours before it was scheduled to begin (see explanatory statement here). Due to the enduring judicial clarification, the marching route was announced only two and a half hours prior to the march. Berlin gegen Nazis issued hourly updates informing the counter-protests in progress with the latest news. 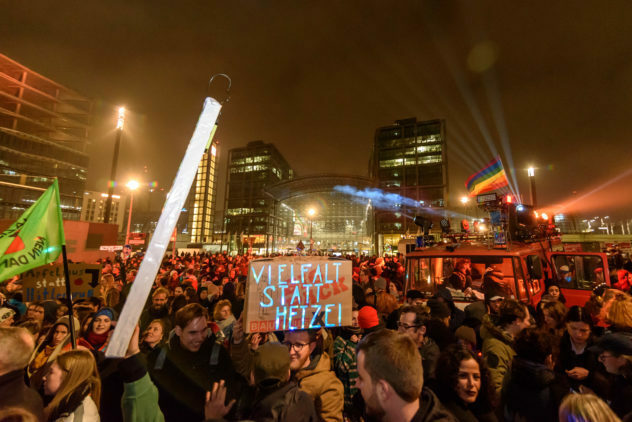 As early as 16:00, a protest demonstration started at Rosa-Luxemburg-Platz under the slogan “Faschismus wegbeamen”, organized by the Berlin club scene’s initiative Reclaim Club Culture with more than 1,000 participants and growing on their way to the final destination Hauptbahnhof. 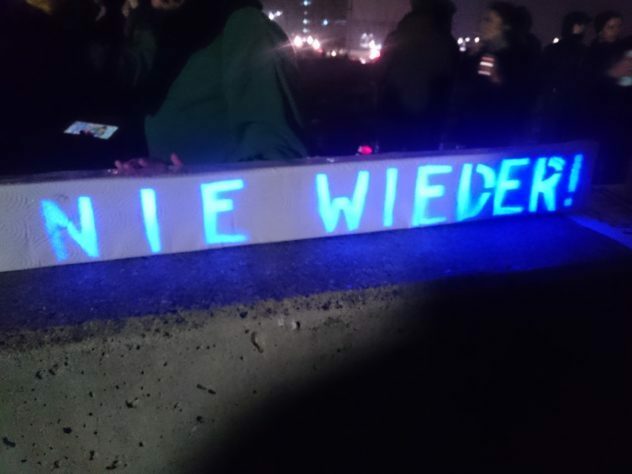 It was distinguished by light installations visualizing the protest against the right-wing extremist march with the city’s buildings as canvas. 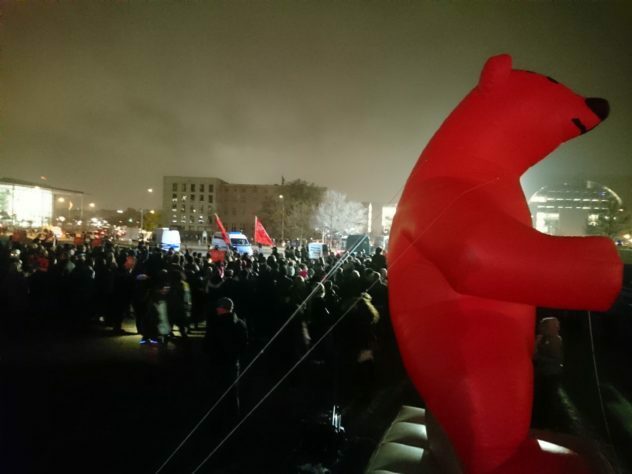 At Washingtonplatz, the demonstrants joined the protest event organized by Berliner Bündnis gegen Rechts, which united several thousand people voicing their protest against the right-wing extremist launch event in its immediate vicinity. 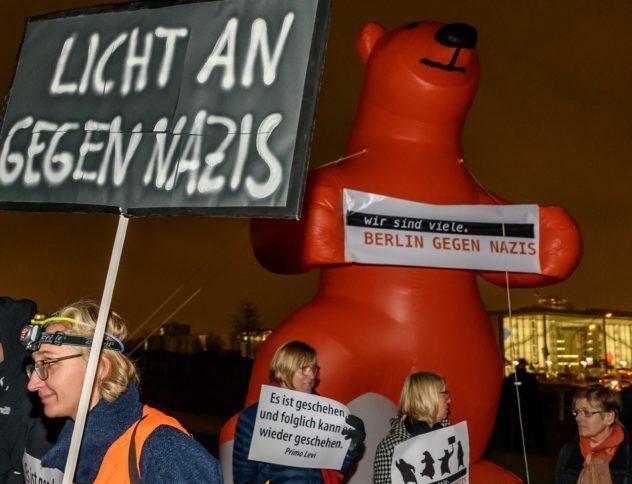 Berliner Bündnis gegen Rechts, an association of non-profits, unions, and left as well as antifascist groups, organized several more events along the right-wing extremist’s demonstration route within eyesight and earshot. 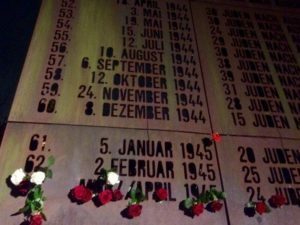 At 17:00, the commemorative event organized by Berliner Vereinigung der Verfolgten des Naziregimes – Bund der Antifaschistinnen und Antifaschisten VVN-BdA , which has been taking place annually since 1990, started at the memorial of deportation at Levetzowstraße in Moabit. Horst Selbiger, honorary chairman of “Child Survivors Deutschland”, gave a speech at the event, after which a demonstration of more than 1,000 antifascists marched towards Haupfbahnhof. In direct vicinity of Moltkebrücke, the demonstration took a halt to protest right next to the demonstration route of the right-wing extremists. The demonstration “Licht an gegen Nazis” on their way to face the right-wing extremist march at Spreebogenpark. November 9, 2018. Photo: Tanzversammlung Rosenthaler. 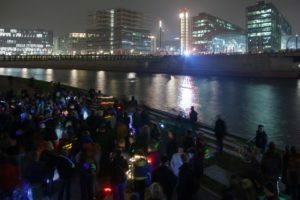 While the right-wing extremist demonstration started (at 18:30), a multi-colored and luminous demonstration with many children and families gathered at the opposite riverbank of the Spree. 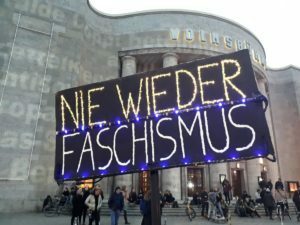 The demonstration took place under the slogan “Licht an gegen Nazis” and was hosted by the initiatives Tanzversammlung Rosenthaler and Anwohnerinitiative für Zivilcourage – Gegen Rechts, and it joined the event of Bündnis für ein weltoffenes und tolerantes Berlin. More than 1,000 people attended the event of the association of churches, trade unions, charities and further actors of civil society to protest the right-wing extremist provocation. At the same time, a joint action campaign of Bündnis für ein weltoffenes und tolerantes Berlin and Berlin gegen Nazis took place. 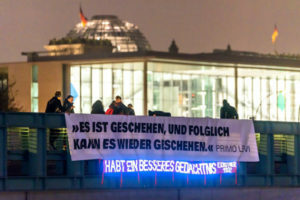 A banner with the inscription of the quote by Primo Levi “It happened, therefore it can happen again”, was distributed to all protestors within eyesight of the right-wing extremist march. 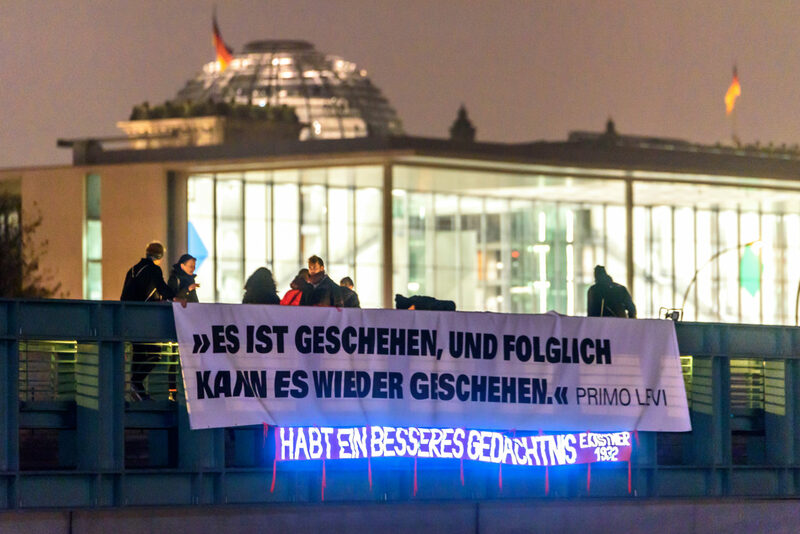 A further banner with a quote by Erich Kästner, “Have a better memory”, was contributed by an active demonstrator.